I must say, I love strange, funny and extraordinary models (that's why I'm a Lima collector ). 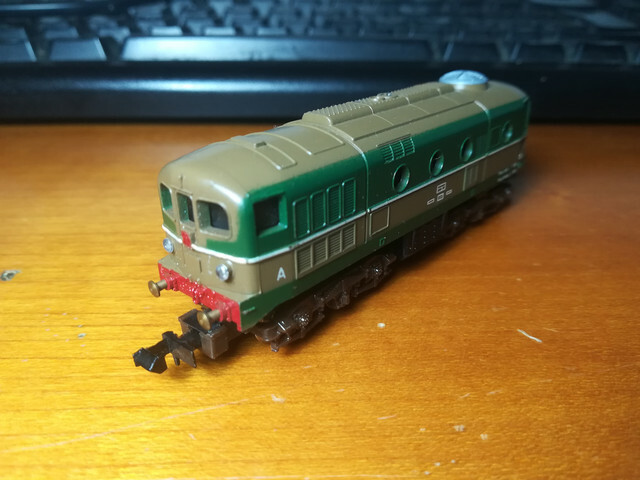 A while ago I managed to buy an Italian type D341 Diesel in New Haven RR colours. Neither was this funny thingy in the Lima catalogue, nor sold under the Lima brand name. It was included in a starter set (I presume it must have been towards the end of the 1960's) branded "Physio-Chem", along with a few New Haven coaches of European origin. The complete set is very rare, single items are rare, too, but show up a little more often. Mine came to me unboxed without coaches. Nevertheless, it's a unique loco from the Lima history. Lima were notorious for this in N and HO. Possibly the funniest was an articulated three axle car transporter (something never seen in the UK at the time) loaded with what were obviously Mercedes Benz cars, and branded "British Leyland" on the transporter! I do wonder whether some of these were testing the market. If your quick repaint of an Italian model sells in the export market then it's worth spending money to tool a proper model. Lima went on to make some rather spiffy models in N which don't embarrass themselves today if given a few tweaks and a repaint, witness the GWR horsebox and Siphon utility van. Interesting. Can you show some of the other models in your collection? I too have a Lima N gauge D341, altough in it's original F.S. colors: chestnut brown and olive green. - the model is hold togheter by just one screw, located (and well visible) on the roof! - it has the bogeys of the E424 electric locomotive. (little note: the first two locomotives in N gauge made by Lima in 1966, were the D341 we're looking at here, and the E424, a small Bo'Bo' electric locomotive intended for local passenger trains. It happened from time to time, during the manufacturing of these two locos for starter sets, that the bogeys could get confused and swapped, so it's not uncommon to find D341s with E424s bogeys and vice-versa! Such thing was, altough, limited only to toy-like train sets: models designated for serious railway modelling had much stricter quality control). - the grey motor turbocharger vent on the top is too high, of the wrong color, and it's located on the opposite side of where it should be!